Optikos Audit Lenses (AL-100, AL-200, AL-300) are high-performance, multi-element lenses, characterized by their low F/number, that are designed to be diffraction limited over a specific spectral region when measured on-axis (at the center of the field of view). They enable the user to test optical test system performance under even the most extreme testing conditions. They are not designed for off-axis measurements–audit lenses are designed to verify OpTest System MTF accuracy and repeatability when measured (only) on axis. 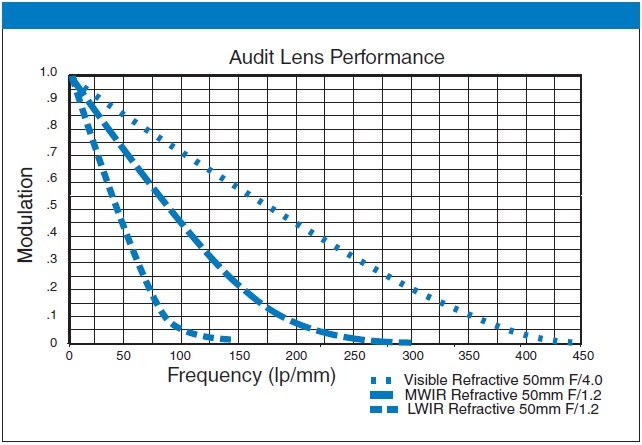 Any deviation from diffraction-limited performance for an audit lens is an indication of problems with the OpTest System (alignment, correction factors, configuration settings ,etc.). Audit lenses are not designed for off-axis measurements. Optikos Reference Lenses (RL-400, RL-500, RL-600) are single element, plano-convex lenses that are NOT designed to be diffraction limited. Because they are made up of a single element, they have very well-defined aberrations that can be predicted from simple measurements of the lens radius of curvature and material index of refraction. As such, the lens aberrations can be accurately predicted on-axis and at off-axis field points (at small angles in the field). Because reference lenses can measured on- and off-axis, they can be used to verify measurements of off-axis aberrations such as field curvature and astigmatism as well as MTF at multiple field points. However, they should not generally be used to verify system MTF accuracy and repeatability. Although these lenses are slower than Optikos Audit Lenses, they provide a convenient means of periodically verifying test system performance under less demanding conditions. All Optikos Audit and Reference Lenses come with lens certification. All Optikos Audit and Reference Lenses come with lens certifications. The AL-100 is designed for validation and verification of an MTF testing system in the visible wavelength range. The AL-200 is an audit lens for validation and verification of the MTF testing system in the mid-wave infrared (MWIR). The AL-300 is an audit lens for validation and verification of the MTF testing system in the long-wave infrared (LWIR). 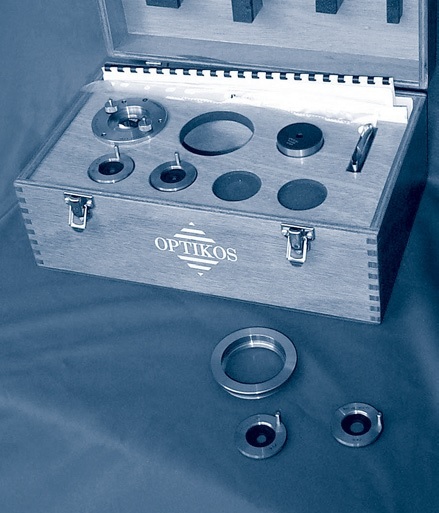 All Optikos Reference Lenses come in a case containing interchangeable apertures and lens certification.